Many join together at the 5K each year to help the manatees! Note: High resolution photos of last year’s race, the 2017 Manatee 5K medal and T-shirt, and manatee images, as well as a video about the race, are available upon request. 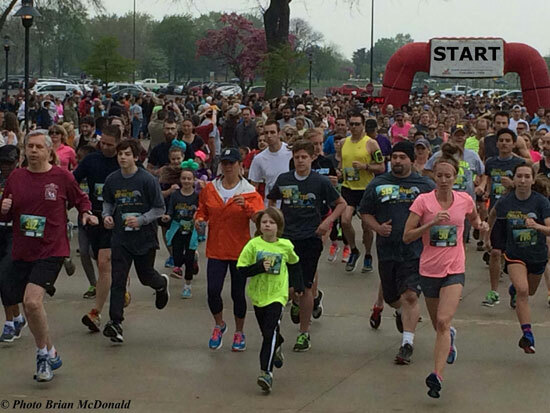 The annual Save the Manatee 5K returns May 20th for its 14th year at the Lake St. Clair Metropark in Harrison Township, Michigan. The 5K, 2 Mile Fun Walk, and Mini Manatee Mile is expected to draw over 1,200 participants to raise awareness about manatees, one of America’s most beloved species. Proceeds from the 5K go to support the education and conservation work of Save the Manatee Club, a Florida-based, international nonprofit organization. You can join the race in person or participate from anywhere in the world by doing a Virtual 5K on a date and time you choose. Walk, run, swim, kayak, or rollerblade your favorite course or trail for the Virtual 5K, and all in support of manatees. The deadline to sign up for the Manatee 5K in Michigan is May 20, 2017, and the Virtual 5K is May 12, 2017. Click the following links to register online for the Save the Manatee 5K Run on May 20th in Michigan or register for the virtual run by May 12th. Participants in the Michigan race can also sign up on the day of the event. The popular race is organized and hosted each year by L’Anse Creuse High School biology teacher, Lesley Argiri. Participants receive a race packet with a unique race T-shirt and race bib as well as a newly-designed finisher medal featuring a manatee in an aquatic setting. Over $145,000 has been raised to help manatees in the past 13 years. The 2016 event in Michigan drew 1,200 participants and the Virtual 5K attracted nearly 800 virtual participants in every state in the U.S. and in nine other countries. Funds from the 5K race help with the Save the Manatee Club’s mission to protect manatees and their aquatic habitat for future generations. The Club works to reduce manatee harassment, injuries, and deaths from human activity as well as protect aquatic habitat by increasing public awareness and education; sponsoring research, rescue, rehabilitation, and release efforts; advocating for strong protection measures, such as boat speed zones and sanctuaries; and taking legal action when appropriate. Save the Manatee Club, a nonprofit 501(c) (3) manatee conservation organization, has been the voice for manatees since 1981. The Club was co-founded by renowned singer/songwriter Jimmy Buffett and former U.S. Senator Bob Graham, when he was governor of Florida. So put your best foot forward for manatees. Register online for the Save the Manatee 5K Run on May 20th in Michigan, a dog-friendly event. Register for the virtual run by May 12, 2017. Get more information and sign up at savethemanatee5k.com. Questions? Contact Race Director, Lesley Argiri at largiri1@hotmail.com. You can also join Save the Manatee Club on Facebook to see photos and videos and get updates on the states and countries that have the most participants. Save the Manatee Club's mission is to protect imperiled manatees and their aquatic habitat for future generations. We are a nonprofit 501(c)(3) organization, and our Federal Tax ID is 59-3131709.